Backup iPhone contacts to Outlook, Google Contacts, Gmail, Android vCard file or another iCloud account. Request additional source for backup, e.g. CSV/XSL files, Office 365, SalesForce CRM, etc. Merge Contacts from multiple sources. 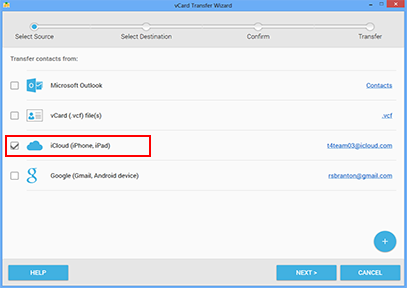 vCard Wizard Contacts Converter Pro Edition is the easiest way to create iPhone contacts backup. Choose the contacts you want to back up, confirm your selection and click Transfer. In just a few seconds, the contacts you have selected will be backed up to the destination of your choice.